A wave of… I’m not quite sure I can put a name to it- sadness, introspection, deep thoughts? A friend has lost 2 friends this month, and maybe that started these thoughts- so that people I’ve been close to that I’ve lost have been on my mind, my brother- Eric- and Steve to name the first few. A friend of mine who I haven’t been as close to as I used to be had surgery this week for liver cancer. So maybe it’s mortality that has me right now. Those thoughts led me to memories in general. Songs on my playlist today have taken me back to the past. On currently is a song I loved when I lived in Seattle, Photograph by Natalie Merchant and Michael Stipe- reminding me of being all by myself out there (I moved to a city across the country all by myself- one thing I’ve done that I’m very proud of). Earlier one played that reminded me of when my husband and I first met- chatting online. A beautiful song w/ very wistful bordering on sad tones. Something so horrible had happened in his life that this song reminds me of the sadness in him at the time. Memories. Which then led me to think of my grandmother. The years she was helpless in a nursing home- immobile and facing her demons. Now that I think about it- have you noticed when visiting nursing homes there are so many screams and incoherent yells? I wonder if that is demon-facing. Grammy had a hard life- and I have to admit that she wasn’t a very nice person. She had some things- probaby many things- that she regretted in the end- and I imagine not very pleasant memories. Which then led me to thinking of the memories I have stored up. Will they be enough to sustain me if I find myself lying helpless in a nursing home in my 90s? So now I’m thinking back- and yeah, I think I will have wonderful “movies” playing in my head. I try to lightly visit those memories occasionally to “cement” them in my mind so that they *will* be there to pull out if I ever need them for my only entertainment. And life is so good right now- there is hard stuff, but we will get through it- that I will have many more good memories to add to the collection. I’ll have to find a way to encourage my kids and step-kids to build their memories, make sure they are ones that they will want to come back to- and this seems strange- but even embrace the sad times- because those become special memories, too. (the lonely times when i moved, after relationships ended, or when I was in long distance relationships, after deaths- those are poignant and I cherish them as much as the giddy, happy ones). And see to it that they don’t store up those “demons” that need to be faced in the end. I was supposed to be knitting for the Charlottesville Art Market next month, but I couldn’t not come over here and type all this. Thanks for listening. 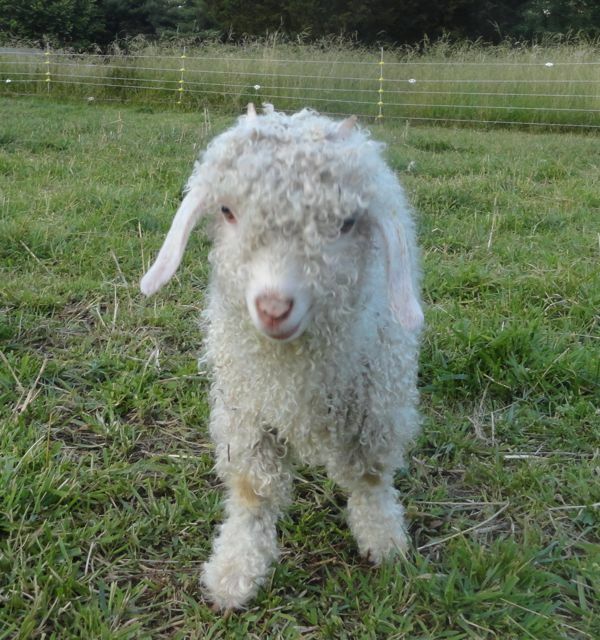 Enough of heavy stuff- baby goats should be coming as early as this weekend!!! There will be happy posts and lots of sweet pictures coming. 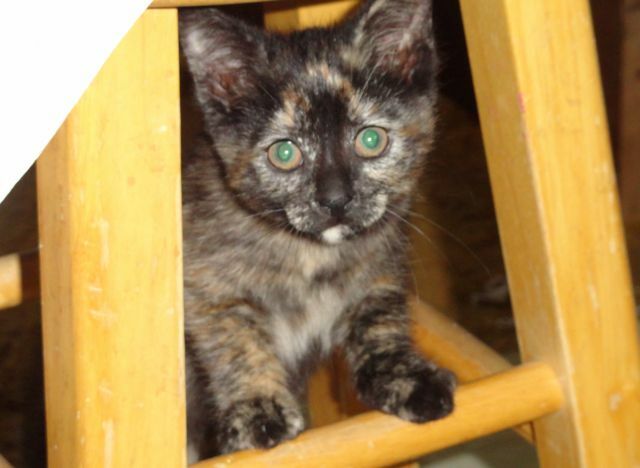 For now, I will leave you with 2 pictures of sweet, sassy Nessie- she will be a year in March! 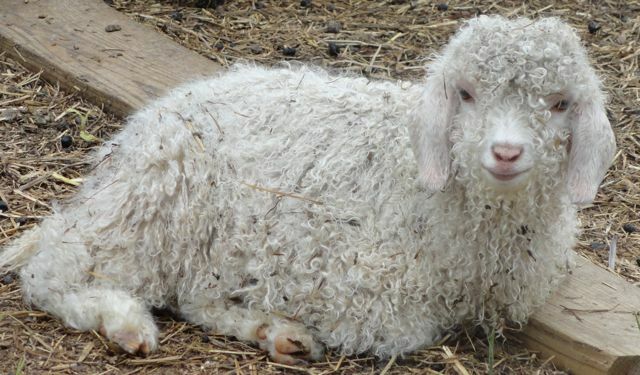 She is still the tiniest thing, and (shhh, don’t tell) even prettier than her momma, Rosie- who to me has always been the epitome of beautiful Angora Goat. 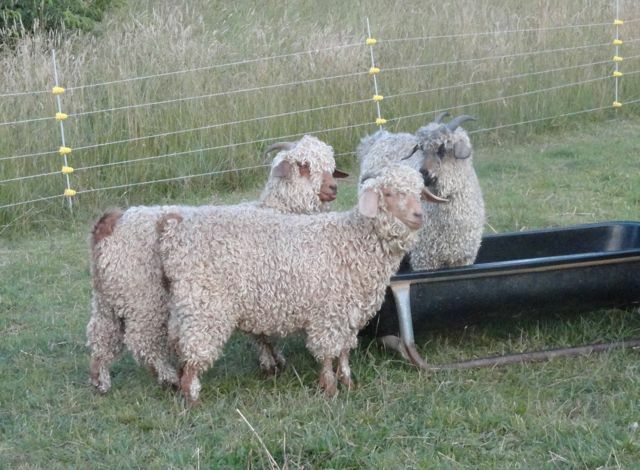 This was shearing day last week. My middlest happened to be home from school that day, and was helping us out. Have a great week and I’ll be back with new babies, soon! On August 23, 1995, I was sitting in the waiting area at the car dealer, having my car tuned up etc- getting ready for the long trip east I knew was coming soon. I was living in Lynnwood, WA at the time- and I loved it there. As I was killing time in the waiting room, I just knew there would be a message on the answering machine when I got home. And I knew what it would say. Sure enough, it was my father, telling me (in a shaky voice) to call him. Eric had died. It wasn’t unexpected. AIDS was most definitely a killer then. But still- expected or not, when your big brother dies, a little of you does, too. I called in to work- no big deal- they knew this was coming, too. 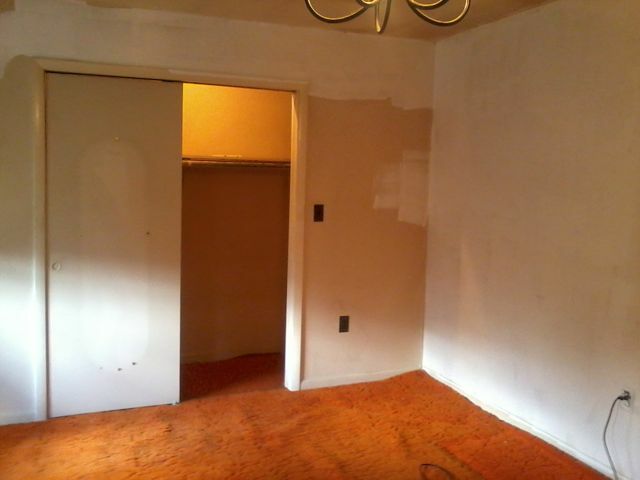 I lit candles, then sat in the middle of the floor and cried. And cried. And cried. That memory is crystal clear. But there are many, many good memories that are just as clear. This year, especially, my sister and I have been thinking of when Eric left for William and Mary to begin college. Williamsburg and Culpeper are about 4 hours apart- but then, when you are 13 and 11 it seems like forever. It’s been on our mind because my nephew is leaving for college, and his little sisters are left behind. They are 6- time and distance are harder to comprehend- they just know that their brother won’t be home. They’ll learn that his going away to college is not a bad thing. When he comes home, he will have so much to tell him- the holidays will be even happier. They’ll get to go visit him and see so many new things. I wish I could get through to all of our kids just how wonderful all of the things their older siblings will show and teach them can be. That’s what I’m remembering this year. Things that I saw, experienced, learned- that I might not have if it weren’t for Eric. What I’m wishing for and missing- pretty much the same as every year. I’ve remarried, and I really wish that Eric and James could have met. I know they would have liked each other. I wish the kids could have known him, and that he could have known them. I wish my parents hadn’t had to have a child die. I wish Manda and I still had our big brother here. I ask you this every year- kiss or hug your brothers/sisters. And if you absolutely have to call them names, please do it with love. Got a good picture of Fluff yesterday… I love this guy. He is 8 years old, the alpha, and there is no doubt that he loves me. Did I tell you this story? Years ago, when I was married to the kids’ father, I was outside doing rabbit chores and my ex was laying in the hammock. The goaties were mowing the lawn. Fluff saw me working, then looked at my ex in the hammock. He looked back and forth a few times- you could actually see the wheels turning- then very determinedly walked over and bent under the hammock and knocked my ex right out! 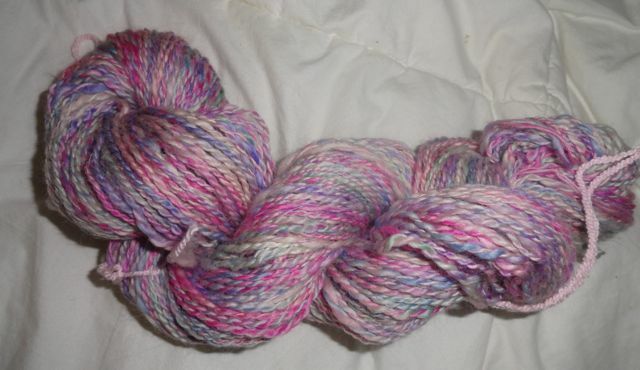 Nothing terribly new on the knitting and spinning front. 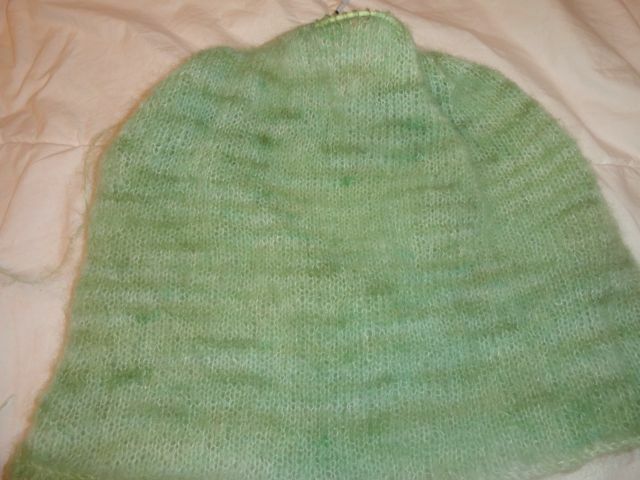 Most of the knitting I’ve done has been on the sweater I’m designing for Persimmon Tree Farm. Right now it is merely a HUGE expanse of red. 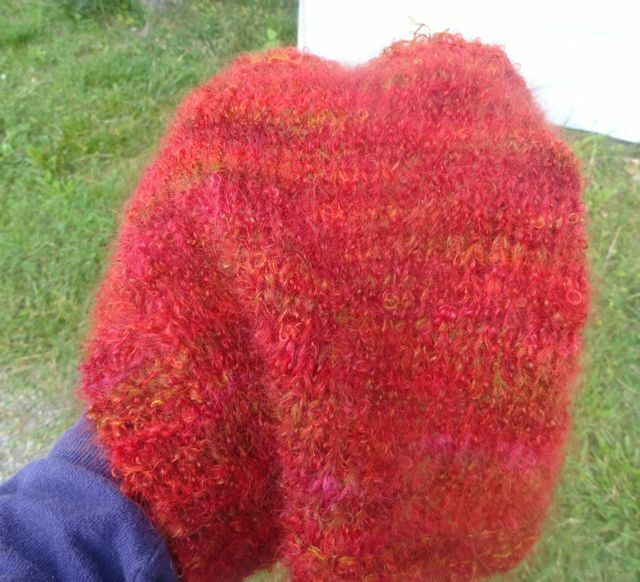 Just goes to show how much I love Greta of Persimmon Tree- red is sooooo not my color! 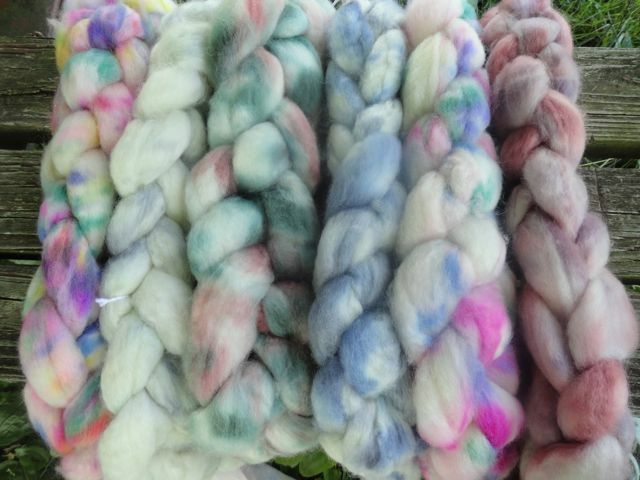 I did get a few more rovings dyed and up in my etsy shop. 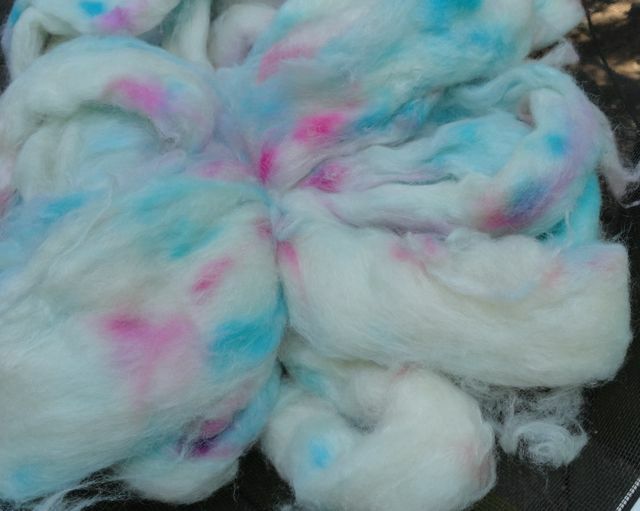 Yeah, some things never change… These rovings are more of the super wash BFL that is such a dream to spin. Having a hard time not keeping them for myself. So that’s about it for now. 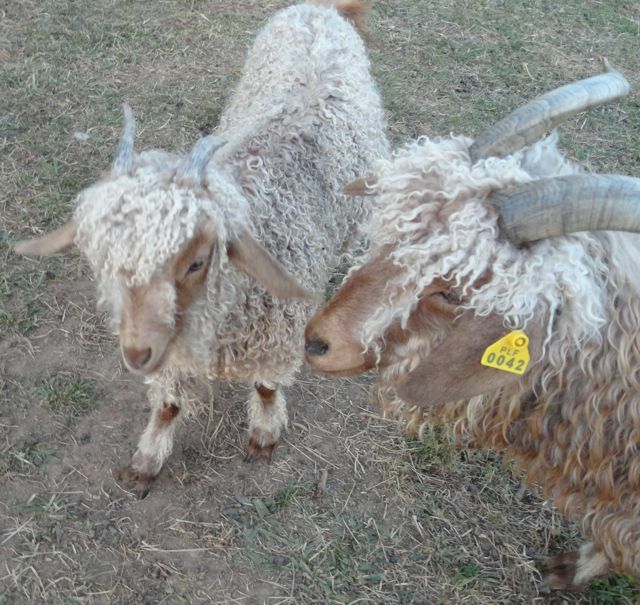 Next week we need to move the goaties back to the first field, I should have a sample knit up for a brushed sweater pattern in addition to the jacket for Persimmon Tree. And lots of other stuff I just can’t think of right now. See, look- I came back! 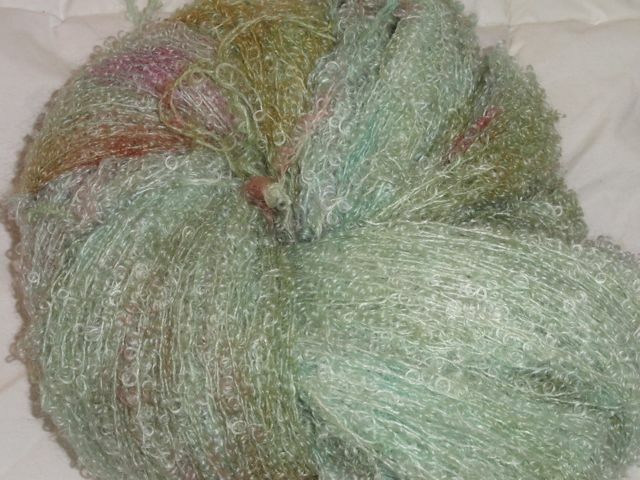 This is one strand baby boucle kid mohair and one strand brushed kid mohair held together. Should be a pretty quick knit- Persimmon Tree requested no waist shaping, no frills- though I think I’m going to sneak in some optional buttons with eye-cord closures. 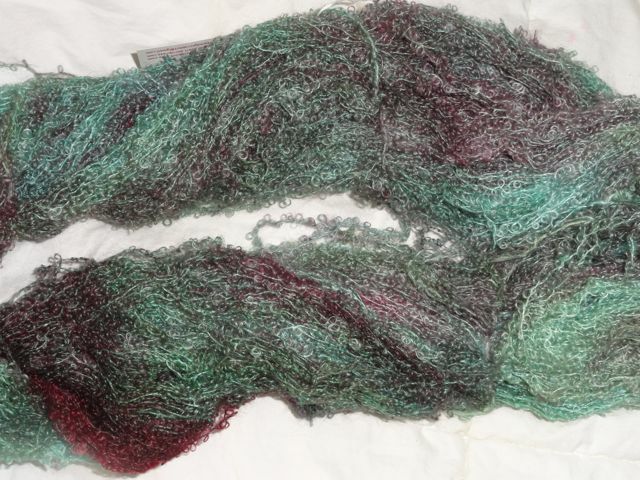 Otherwise, the gorgeous colors and texture of the yarn will do all the work. Once done and the pattern is written, I will do up a sample for my shop, too. The other sweater I’m working on is a cowl-neck pullover w/ waist shaping and raglan sleeves, worked in brushed kid mohair. 204 yards at 15 wpi. I’m not sure yet if I will list this for sale, or keep it to play with. 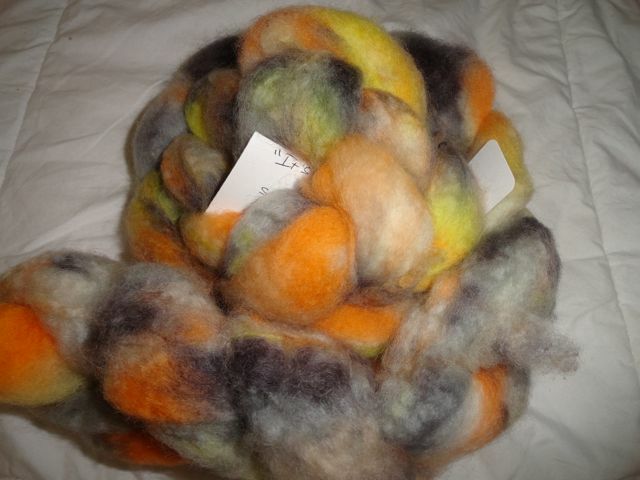 This is the first skein I’ve spun from the new roving I am dyeing and carrying. 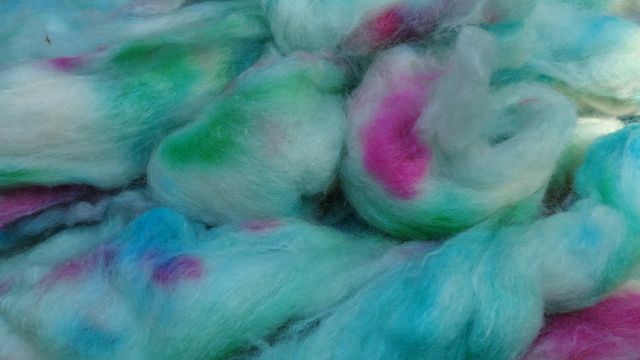 Which brings us to what is currently in https://www.etsy.com/shop/puffthemagicrabbit. 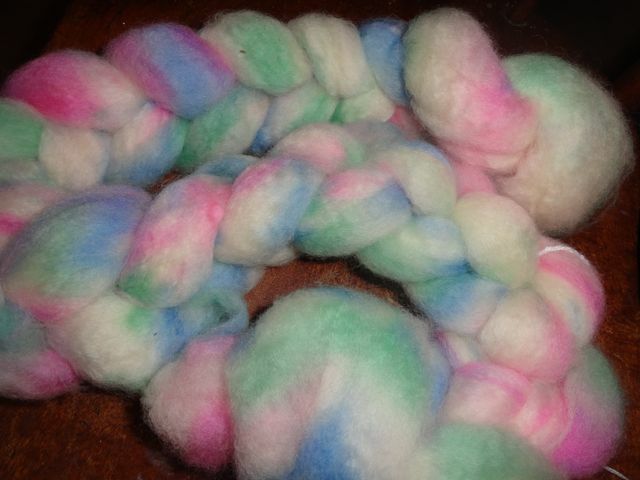 For now, all that is in the shop is several hanks of super wash BFL top- even 2 that were hand dyed by my sons. Or perhaps you’ve already begun thinking of Halloween? Those are just a few… go take a look! She is a busy little thing- and an absolute sweetheart! 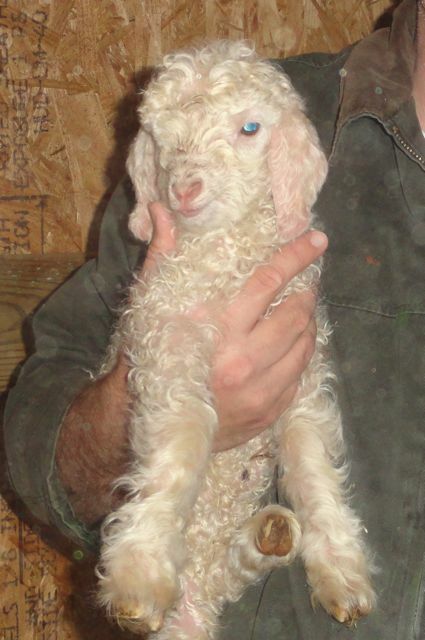 Next time I will introduce you to the bottle baby goat we have, as well as 2 rescues we picked up. Sometime this month I will be picking up 3 yearling does from Persimmon Tree Farms- lots of color entering our little herd! Wow, it’s been awhile. If I blame it on busyness, then it’s just excuses, yet we all know how life can take over- and it has been busy since last I was here. Had I told you we were moving? 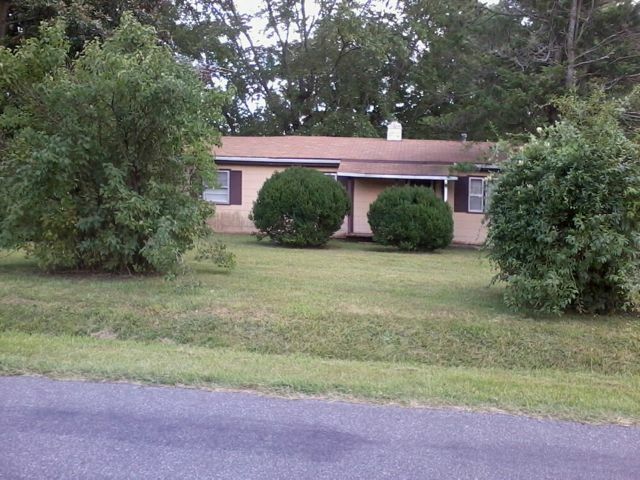 We left Madison County and moved to Louisa County in Sept. (still in VA). 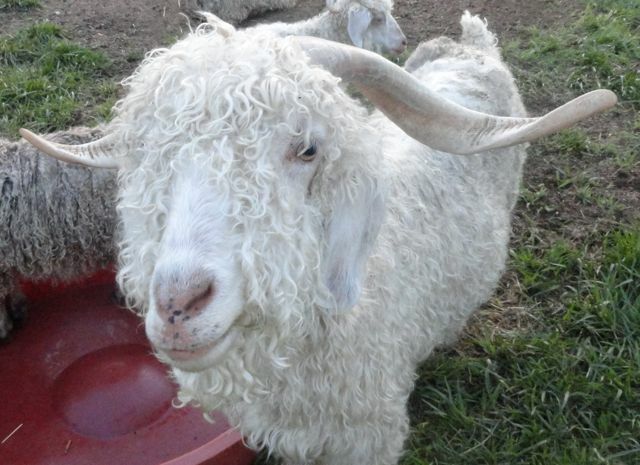 It has been a great move for the kids- and a fantastic move for the goaties. 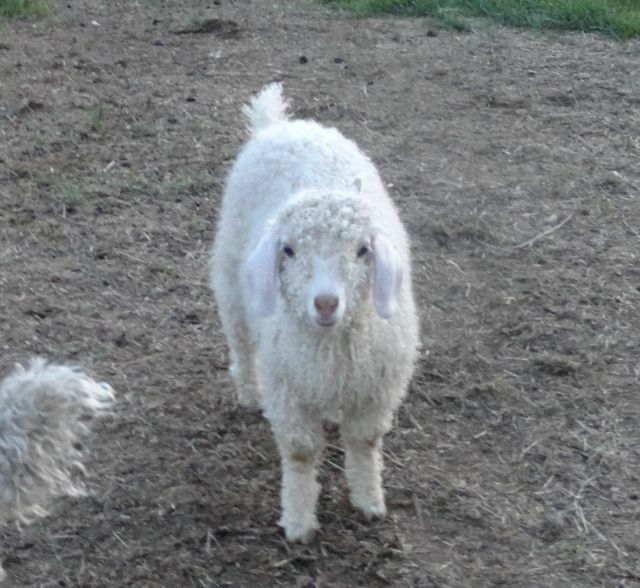 I did lose some goats this year- Genevieve, Fiyero, and sweet little Floppy. I should have written then, but I just couldn’t. Floppy, who originally wasn’t expected to make it a full year left when he was almost 3. He remained a sweet little happy-go-lucky guy, and he took going downhill and dieing just like he took living- to him it was all good. He didn’t fight it at the end- not to say that he surrendered early- he loved us and loved life- but when it was inevitable he just… went. 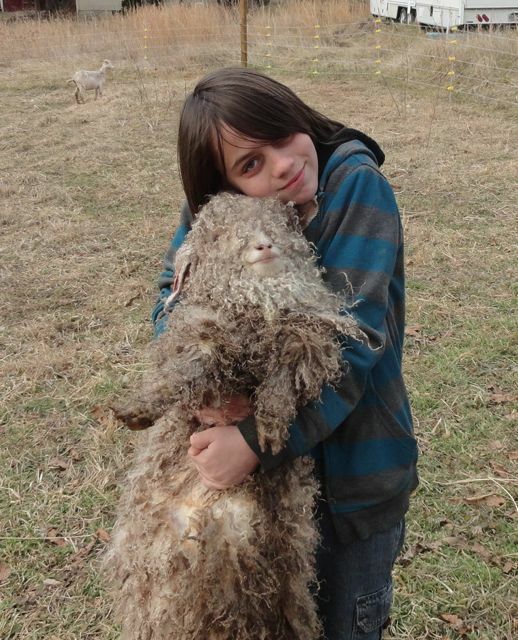 We had 3 does kid this winter. 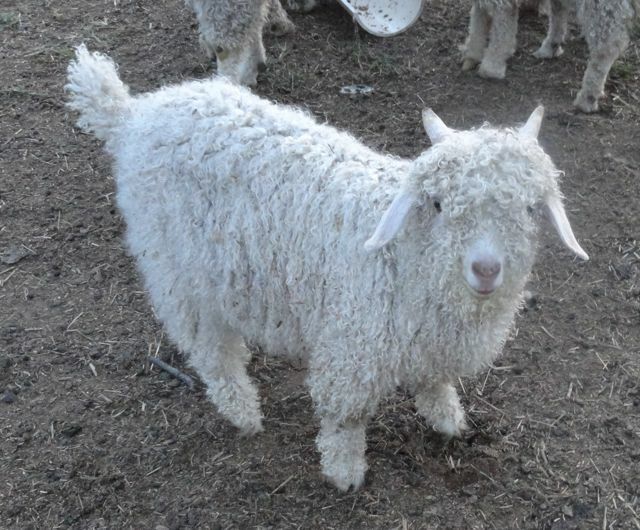 Elphie’s breeding didn’t take. 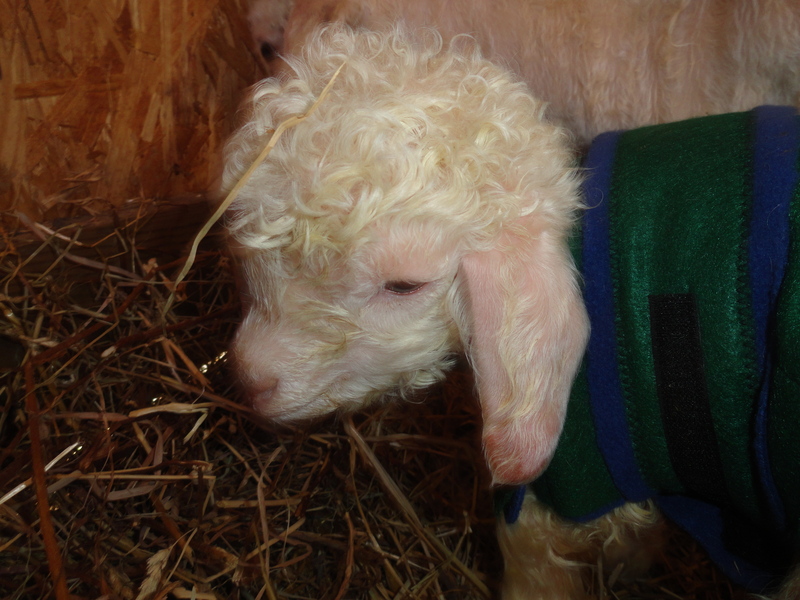 Cream went first- on Feb. 17 Mephistopheles was born. 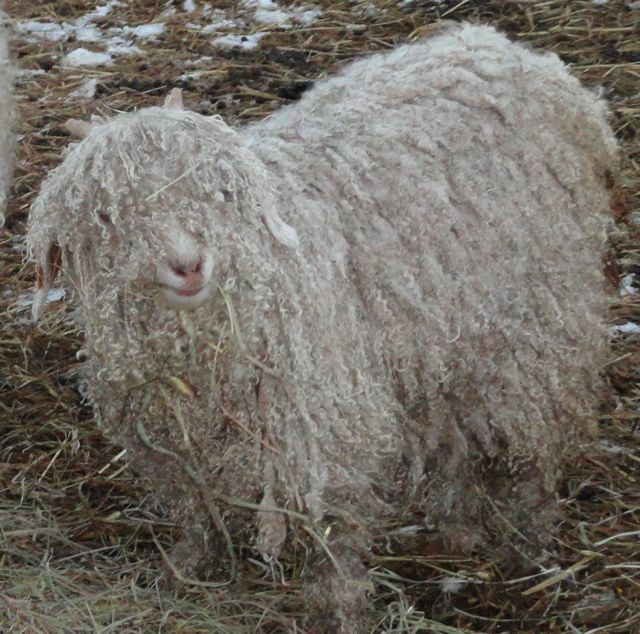 He has sooooo much sweet silky mohair on him- I can’t wait until his first shearing! Baby Rae-Ella caught on momma’s neck. Today she is a happy little girl who is hard to catch keeping still! Last to kid was pretty Rosie. This is her very last breeding, and I so wanted a doe from her. 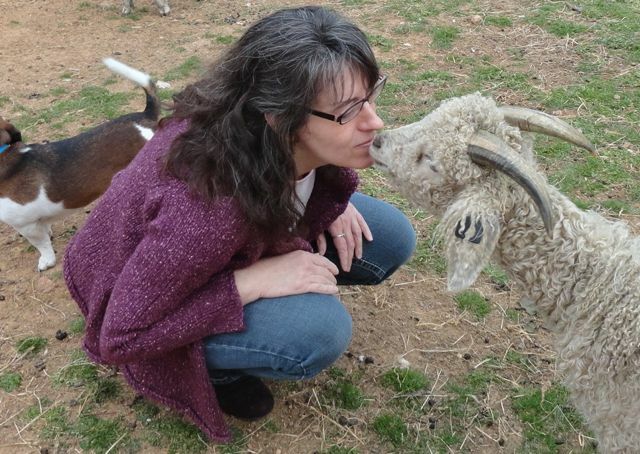 I got my wish, and I couldn’t have asked for a prettier, sweeter little doeling. 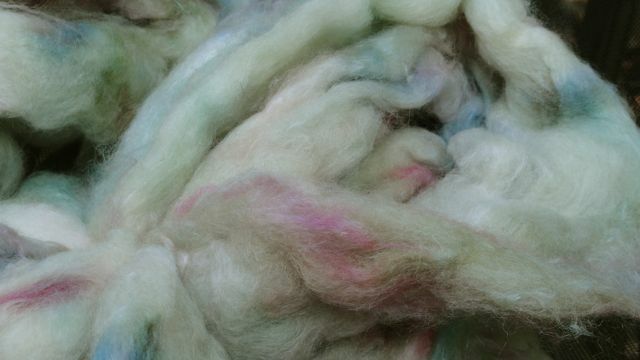 Her mohair is so silky and dense. We also acquired a few more adults and a bottle baby- will fill you in on them, later. Oh, and the guy holding newborn Nessie? He’s my husband now. 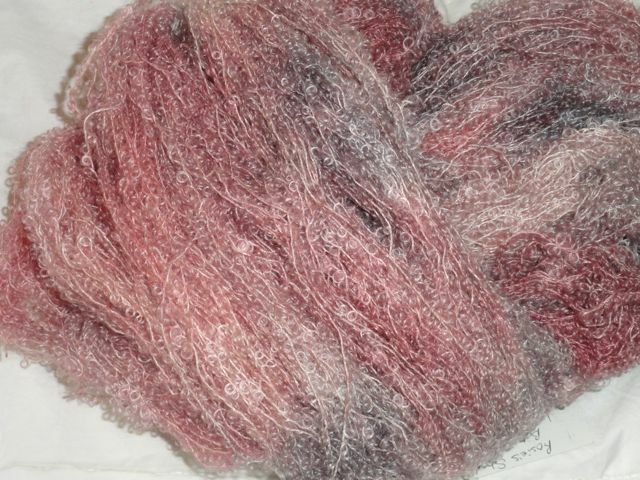 Now, it’s time for me to go design a sweater for Persimmon Tree Farm- this will also be available with my yarns- it will be a strand of baby boucle mohair and brushed kid mohair held together. Pictures will come, I promise. I will no longer neglect my sweet blog. this is just a quick stop-by to let you know that i just made a HUGE update to my etsy shop- http://www.etsy.com/shop/puffthemagicrabbit. 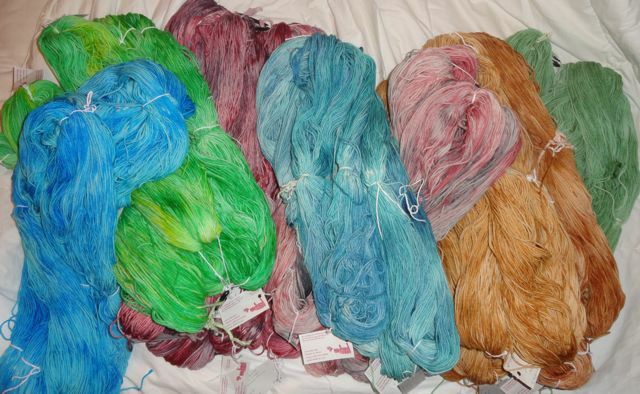 there are 7 colorways of superwash sport weight merino yarn. the pattern is free with a purchase of the yarn, just leave me a note. 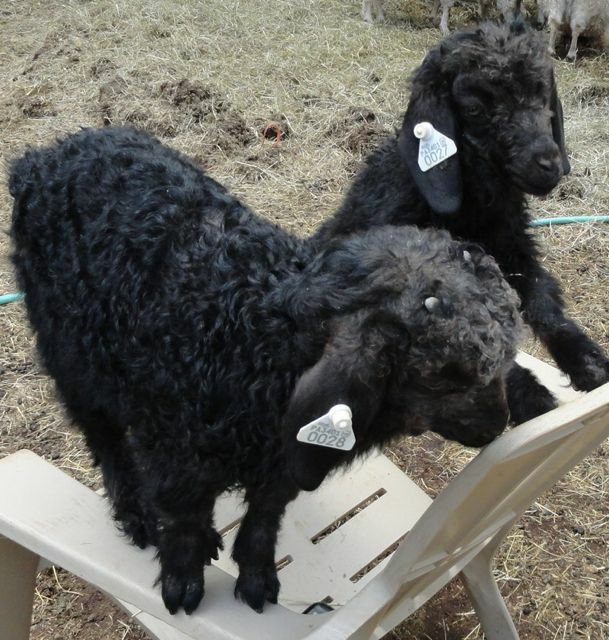 eventually i will have it for sale at etsy for 5.00.
the little black baby goats are doing well. 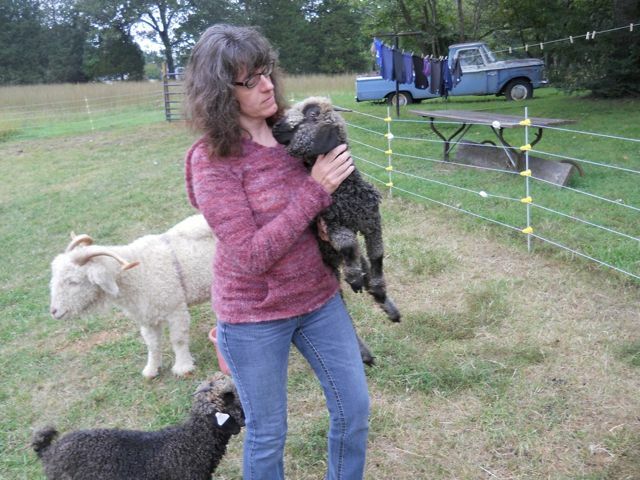 Claire has just come through a bout of listeriosis, which is pretty serious and often fatal, but i was able to catch it quickly and with some instructions from more experienced breeders, we were able to treat her right away. i have to tell you, boyfriend has been an incredible help with all of this- he has jumped right in and done anything my crazy little farm has needed. when we were bottle feeding the she devils, Tess claimed him as hers! new additions- rescues!! a small herd was rescued out of a bad situation by a wonderful breeder in KY. we adopted a mother/daughter pair- Dixie is the mom and Stevie is the daughter- beautiful red does! 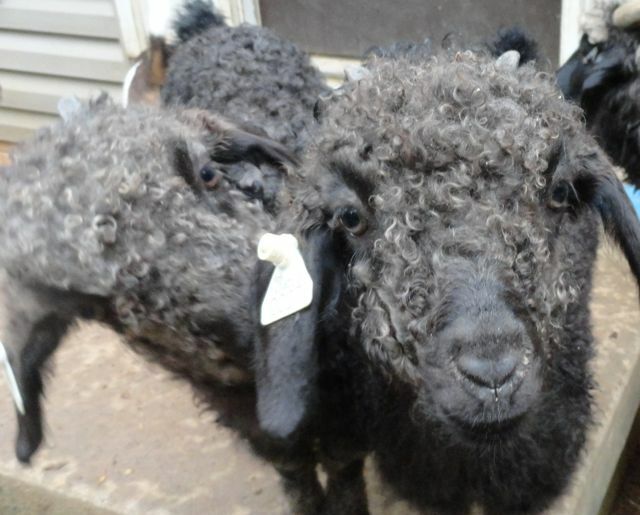 can’t wait until their first shearing! annnnd, come february- the kids will start coming! 4 of my girls spent time at Kid Hollow farm being bred- so things will be very exciting around here, soon. so that’s the short update- hope you all are great, and i’ll be back here soon! one last picture- my blue-eyed boy Aidan. For the field, the corner post holes are dug, I’ve placed all the inner posts, and as soon as we get water out there (original owner replacing well-pump) we can set the corner posts, string the fence, and move the goats! (not to mention clean the house and move the people). The kids (human variety) are thrilled. This means that I am able to expand my farm, which means I can expand Puff the Magic Rabbit. 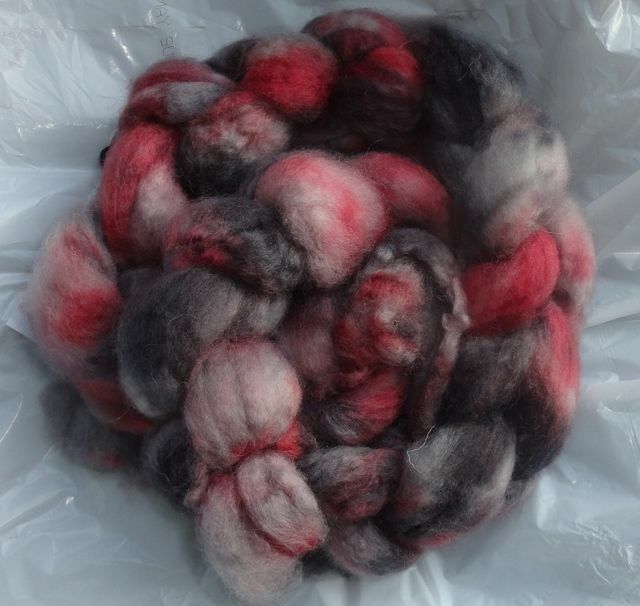 In a few weeks I expect to be in full dyeing, carding, spinning, designing, and knitting production. 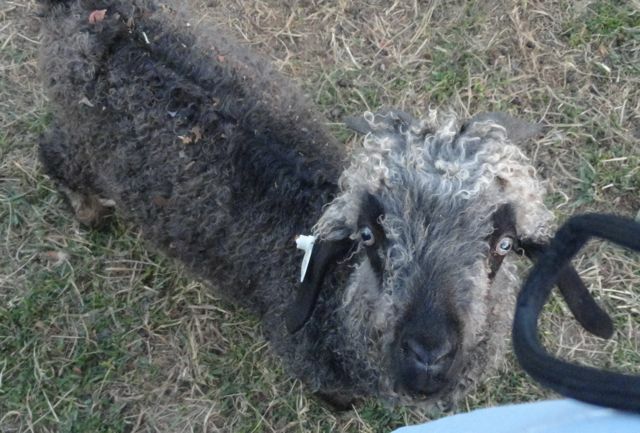 Also, this weekend I will be taking a few of my does down to Kid Hollow farm to be bred- so we’ll have babies this spring. 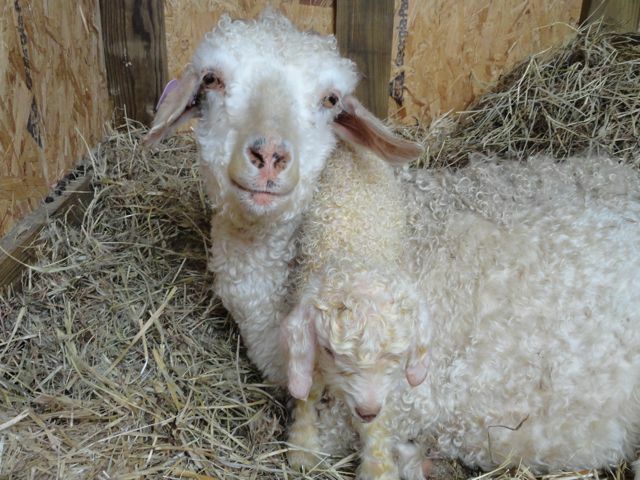 Ohhhh, and I forgot to tell you about the new arrivals- bottle babies Claire and Tess! This is Aidan. I finally got another little blue-eyed black. (I still miss Morpheous). 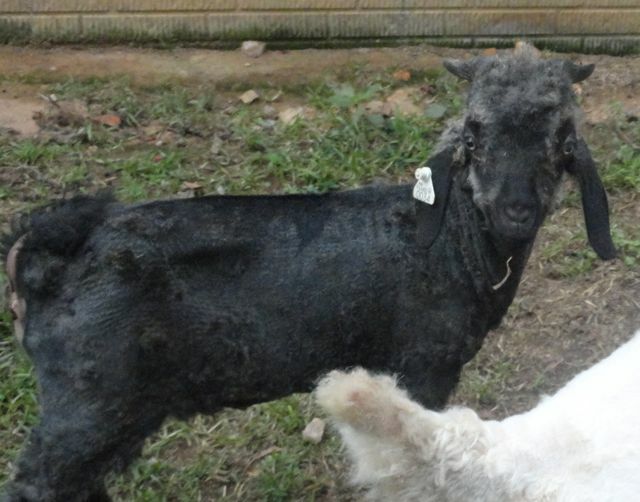 This was just after shearing last month- I think he was happy with his new haircut. 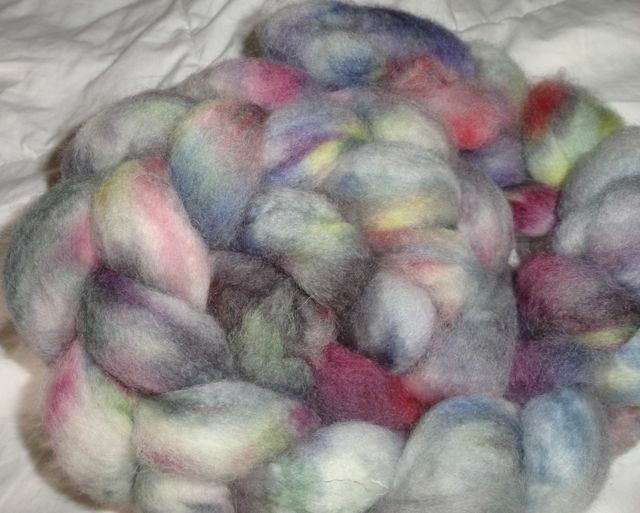 All a super-soft blend of kid mohair from my goats, shetland lambswool from a virginia farm, and silk. Several more colors. I think that is enough excitement for one night. So I will leave you with one last picture of Claire and Tess. Goodnight!